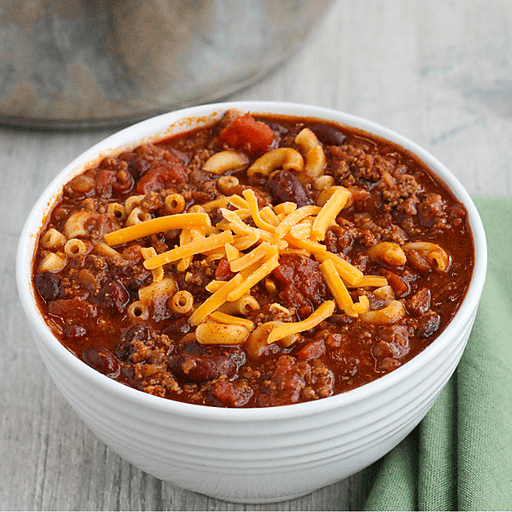 This flavorful Quick and Easy Chili recipe uses only seven (yes, seven!) ingredients and is ready in less than 20 minutes. It’s perfect for game days, hectic weeknights or for days when you just do not want to cook. We recommend making a double batch because you will definitely want leftovers! 1. Cook ground beef and onion in large skillet on medium-high heat for 5 minutes, stirring occasionally. Drain fat. 1. Stir in seasoning mix, kidney beans, diced tomatoes and tomato sauce. Bring to boil and then reduce heat to low. Cover and simmer 10 minutes, stirring occasionally. 1. Stir in cooked elbow macaroni and serve with desired toppings. Top with shredded cheese, sour cream, saltine crackers, corn chips, olives and green onions. Calories 530, Total Fat 20g (Saturated 7g, Trans 1g), Cholesterol 75mg, Sodium 980mg, Total Carbohydrate 53g (Dietary Fiber 7g, Total Sugars 7g, Includes 0g Added Sugars), Protein 33g, Vitamin D 0%, Calcium 8%, Iron 30%, Potassium 20% *Nutritional values are an approximation. Actual nutritional values may vary due to preparation techniques, variations related to suppliers, regional and seasonal differences, or rounding.